Mombasa Airport is also referred to as Moi International Airport or Mombasa International Airport. It is situated in the city of Mombasa, Kenya. It is located in a township known as Port Reitz in Mombasa District that lies along coast of the Indian Ocean in Southeastern Kenya. It is the second largest Airport in Kenya, after the Jomo Kenyatta International Airport in the capital city of Kenya, Nairobi. There are private companies that transport tourists from the airport to their choice destinations. If you do not feel like travelling by a private van, there are always taxis available. You can easily identify the taxis by the color; they are painted yellow. The airport does not have any Airport shuttles. If you would like to travel buy bus, you will have to settle for the Matatu, which is usually a fourteen-seater minibus. The public means of transport are found outside the airport. Make a point of asking the charges so that you can be sure about it. Car rental is still an option, and perhaps the best option to travel from the airport and tour the city of Mombasa. The city has plenty of sights, therefore it is advisable that you rent a car and get to explore most of what the city has to offer. There are many car rental companies in Mombasa hence getting a cheap car hire service provider is possible. Other transport means include Tuk Tuks, boda boda motorcycles and bicycles. Can I exchange currency at the Airport? It is possible to exchange your currency at the airport. The currency used in the country is known as the Kenya Shilling. Ensure that you change it at a bank or forex exchange bureau at the airport. In case you are headed to a hotel or maybe Safari lodge, carry some Kenyan money with you. The exchange rates in hotels and safari Lodges tend to be higher. In case you would like to use either a credit or debit card, there are major outlets in the city that provide fro this. ATMs are also available at the airport. 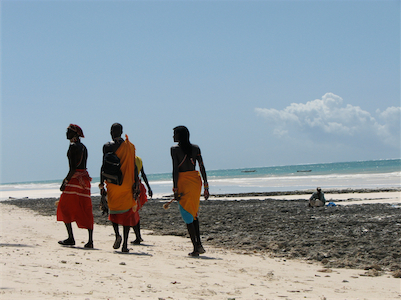 Are there tourist destinations worth in Mombasa? They date back to the year 1952, and they were built to commemorate Queen Elizabeth’s first visit to Mombasa town. They are built of steel and not ivory as many people think. They are situated at the city’s entrance and are a major landmark of the city. It is Mombasa’s most famous sight. It holds a wide range of articrafts dating back to when the city was a slave transit port during the slave trade era. It comprises of torture rooms, cells, along with plenty other displays dating back to the 16th century. Mombasa has plenty of beaches for the tourist who loves sun bathing on the beach or simply to enjoy the water. If you would like to visit a couple of them, it is advisable that you rent a car for convenience purposes. Most major car rental agents in Mombasa Airport offer one way rentals. One-way rental is when you collect the car in one place and return the car in another location. In most cases the car rental agent will charge an extra fee if you wish to return the vehicle at a different location. In the terms and conditions will state if the one-way fee is included in the rental price. If the one-way charge is not included in the rental price, the one way charge needs to be paid on arrival directly to the car rental agent. Rentalcargroup.com compares car rental prices for Mombasa Airport). We work with many car rental companies so the quality of the cars is guaranteed. This way you will be sure to get a rental car that suits you the best and for a competitive price. Last month, the average car rental length at Mombasa Airport was 0 days. The average rental car length at Mombasa Airport is 5 days. The most booked rental car type currently at Mombasa Airport is cars. Last year, the most booked rental car type at Mombasa Airport were COMPACT cars. How much does it cost to rent a car at Mombasa Airport? Last month, the average car rental price was 0 USD. Last year, how much did it cost to rent a car at Mombasa Airport? Last year, the average car rental price was 831 USD. What is the current average daily price to rent a at Mombasa Airport? Last month, the average rental price was NAN USD per day. How much did it cost to rent a car at Mombasa Airport over the past 12 months? Last Year, the average rental price was 166 USD per day. The car rental companies available at Mombasa Airport are: . See below last 5 customer reviews. Our customers rated Mombasa Car Rental with an average of 0.00 based on 0 ratings.